Neuronal acetylcholine receptor subunit beta-2 is a protein that in humans is encoded by the CHRNB2 gene. 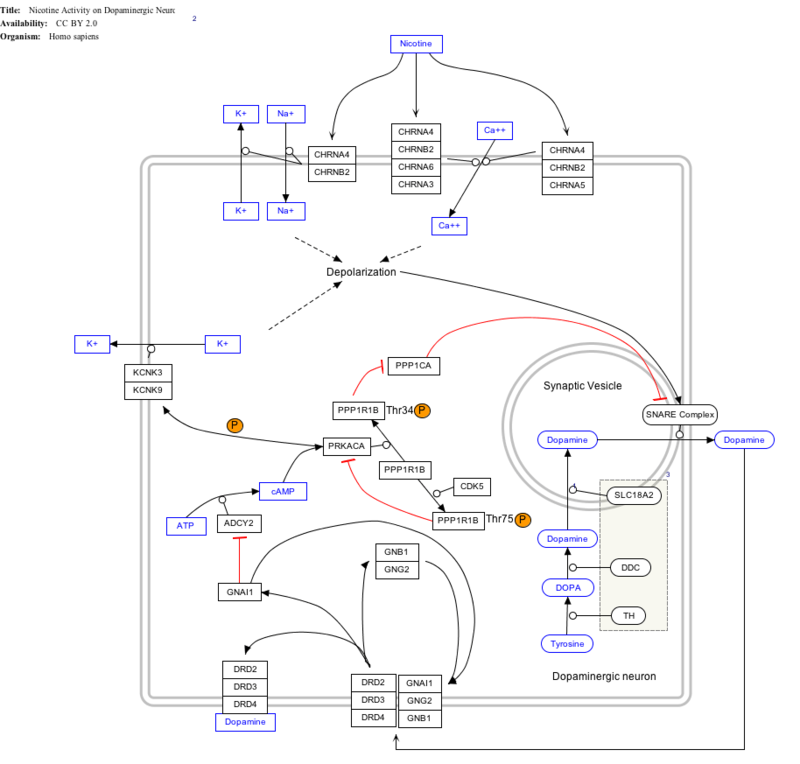 ↑ The interactive pathway map can be edited at WikiPathways: "NicotineDopaminergic_WP1602". ↑ Anand R, Lindstrom J (Sep 1992). "Chromosomal localization of seven neuronal nicotinic acetylcholine receptor subunit genes in humans". Genomics. 13 (4): 962–7. doi:10.1016/0888-7543(92)90008-G. PMID 1505988. 1 2 "Entrez Gene: CHRNB2 cholinergic receptor, nicotinic, beta 2 (neuronal)". Skorupska E, Rózycka A, Trzeciak WH (2002). "[Molecular and genetic basis of idiopathic nocturnal frontal lobe epilepsy]". Neurol. Neurochir. Pol. 36 (3): 513–25. PMID 12185808. Bracci L, Lozzi L, Rustici M, Neri P (1992). 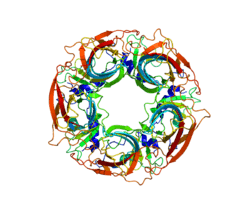 "Binding of HIV-1 gp120 to the nicotinic receptor". FEBS Lett. 311 (2): 115–8. doi:10.1016/0014-5793(92)81380-5. PMID 1397297. Anand R, Lindstrom J (1990). "Nucleotide sequence of the human nicotinic acetylcholine receptor beta 2 subunit gene". Nucleic Acids Res. 18 (14): 4272. doi:10.1093/nar/18.14.4272. PMC 331211 . PMID 2377478. Elliott KJ, Ellis SB, Berckhan KJ, et al. (1997). "Comparative structure of human neuronal alpha 2-alpha 7 and beta 2-beta 4 nicotinic acetylcholine receptor subunits and functional expression of the alpha 2, alpha 3, alpha 4, alpha 7, beta 2, and beta 4 subunits". J. Mol. Neurosci. 7 (3): 217–28. doi:10.1007/BF02736842. PMID 8906617. Groot Kormelink PJ, Luyten WH (1997). "Cloning and sequence of full-length cDNAs encoding the human neuronal nicotinic acetylcholine receptor (nAChR) subunits beta3 and beta4 and expression of seven nAChR subunits in the human neuroblastoma cell line SH-SY5Y and/or IMR-32". FEBS Lett. 400 (3): 309–14. doi:10.1016/S0014-5793(96)01383-X. PMID 9009220. Rempel N, Heyers S, Engels H, et al. (1999). "The structures of the human neuronal nicotinic acetylcholine receptor beta2- and alpha3-subunit genes (CHRNB2 and CHRNA3)". Hum. Genet. 103 (6): 645–53. doi:10.1007/s004390050885. PMID 9921897. Lueders KK, Elliott RW, Marenholz I, et al. (1999). "Genomic organization and mapping of the human and mouse neuronal beta2-nicotinic acetylcholine receptor genes". Mamm. Genome. 10 (9): 900–5. doi:10.1007/s003359901111. PMID 10441742. Steinlein OK (2000). "Neuronal nicotinic receptors in human epilepsy". Eur. J. Pharmacol. 393 (1–3): 243–7. doi:10.1016/S0014-2999(00)00065-0. PMID 10771020. De Fusco M, Becchetti A, Patrignani A, et al. (2000). "The nicotinic receptor beta 2 subunit is mutant in nocturnal frontal lobe epilepsy". Nat. Genet. 26 (3): 275–6. doi:10.1038/81566. PMID 11062464. Phillips HA, Favre I, Kirkpatrick M, et al. (2001). "CHRNB2 is the second acetylcholine receptor subunit associated with autosomal dominant nocturnal frontal lobe epilepsy". Am. J. Hum. Genet. 68 (1): 225–31. doi:10.1086/316946. PMC 1234917 . PMID 11104662. Samochocki M, Zerlin M, Jostock R, et al. (2001). "Galantamine is an allosterically potentiating ligand of the human alpha4/beta2 nAChR". Acta Neurol. Scand. Suppl. 176: 68–73. PMID 11261808. Engidawork E, Gulesserian T, Balic N, et al. (2002). "Changes in nicotinic acetylcholine receptor subunits expression in brain of patients with Down syndrome and Alzheimer's disease". J. Neural Transm. Suppl. (61): 211–22. doi:10.1007/978-3-7091-6262-0_17. PMID 11771745. Lueders KK, Hu S, McHugh L, et al. (2002). "Genetic and functional analysis of single nucleotide polymorphisms in the beta2-neuronal nicotinic acetylcholine receptor gene (CHRNB2)". Nicotine Tob. Res. 4 (1): 115–25. doi:10.1080/14622200110098419. PMID 11906688. Duga S, Asselta R, Bonati MT, et al. (2002). "Mutational analysis of nicotinic acetylcholine receptor beta2 subunit gene (CHRNB2) in a representative cohort of Italian probands affected by autosomal dominant nocturnal frontal lobe epilepsy". Epilepsia. 43 (4): 362–4. doi:10.1046/j.1528-1157.2002.39001.x. PMID 11952766. Heeschen C, Weis M, Aicher A, et al. (2002). "A novel angiogenic pathway mediated by non-neuronal nicotinic acetylcholine receptors". J. Clin. Invest. 110 (4): 527–36. doi:10.1172/JCI14676. PMC 150415 . PMID 12189247. Lin L, Jeanclos EM, Treuil M, et al. (2003). "The calcium sensor protein visinin-like protein-1 modulates the surface expression and agonist sensitivity of the alpha 4beta 2 nicotinic acetylcholine receptor". J. Biol. Chem. 277 (44): 41872–8. doi:10.1074/jbc.M206857200. PMID 12202488. Kawamata J, Shimohama S (2002). "Association of novel and established polymorphisms in neuronal nicotinic acetylcholine receptors with sporadic Alzheimer's disease". J. Alzheimers Dis. 4 (2): 71–6. PMID 12214130.